Gloves Ahoy! A Cool Alpinestars Handshake. 2014 is shaping up to be a pretty good year for motorcyclists. KTM is bringing the Super Duke R 1290 stateside, MotoGP rules are changing to level the playing field between factory and non-factory riders, and Suzuki has released a prototype of a 500cc turbo-charged parallel twin which they claiming will make over 100 hp. In addition to all this, there have already been a ton of awesome new gear releases which have kept all of us at RevZilla quite busy over the past few months. The gang from Alpinestars stopped by our offices a few weeks ago to fill us in on what to expect from them in 2014. There will be plenty new additions to their lineup as well as some updates to current favorites. Their entire line of entry level to intermediate gloves will be getting a facelift, starting with the SMX-2 Air Carbon glove. The Alpinestars SMX-2 Air Carbon and Alpinestars Stella SMX-2 Air Carbon has been a favorite amongst the staff here at ZLA headquarters. For 2014 Alpinestars will be performing some decisive changes to make an already good glove even better. The biggest upgrades are the new patented carbon fiber knuckles and the redesigned cuff which aids in both comfort and safety over the last model. The amount of goatskin in the palm has been increased for better feel while also improving upon the touchscreen compatible fabric at the thumb and pointer finger. 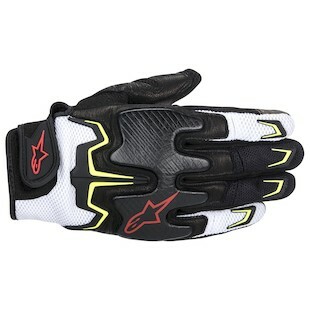 The latter being a popular feature for almost all of the gloves in Alpinestars lineup for this coming year. The Masai is going to be an all new model on par with the SMX-2 Air Carbon but geared more toward the the dual sport, adventure riders among us. The outlandish graphics and colors come directly from the Motocross world. The main palm construction is going to be goatskin and come complete with a PU slider. The TPR knuckles are surrounded by spandex which allow this glove to be super comfortable and breath a ton of air. 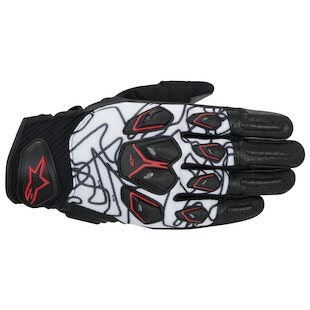 The Alpinestars Masai Gloves are really a summer glove with a little room to stretch into late Spring or early Fall. 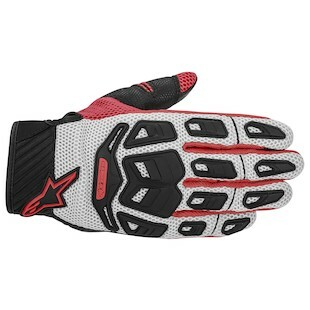 A full dirt version of the Masai can be found in the all-new Alpinestars Atacama Air Glove. It will share the same goatskin palm of it’s more street oriented counterpart while utilizing a breathable 3D mesh in the main body of the glove, perfect for the heat of summer. It still has flexible TPR protection on the knuckles and the fingers but is not as armored as the Masai, as it is not intended for street applications. 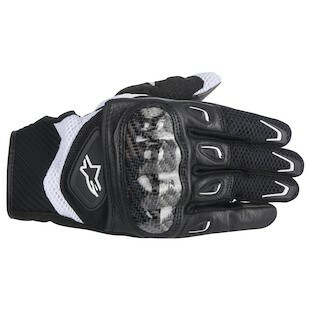 The Alpinestars Fighter Air Gloves are going to round out this category. It is geared towards value oriented riders looking for a solid option when entering into the world of dirt or light dual sport riding. While retaining a few goatskin accents, the main body of the palm is going to be constructed of Clarino, a synthetic leather alternative. Knuckle protection is provided via Bovine leather knuckle armor stretched over high density foam. Even in this entry level option Alpinestars is including the touchscreen fingertips that we have seen in all of the offerings being discussed here. So far this year we have witnessed some pretty great releases from brands like Rev’It!, Roland Sands Design, Klim, Olympia, SIDI, TCX, and now Alpinestars. It is a great time to be a motorcyclist. Whether you are a seasoned veteran or you are just getting started on two wheels, there will be a perfect option to match your riding style and budget. For those of us working in the motorcycle industry this is our favorite time of year. For me it is like Christmas morning all over again and each product release is like another present waiting to be opened. I love to see what new toys are being released and I end up spending way too much money adding new goodies to my garage as well as my closet. After seeing the new SIDI Mag-1 Race Boots I finally understand women’s obsession with shoes and their willingness to spend so much money on them. The downside to this time of year is that now I have to have that awkward conversation with my landlord as to why I am wearing his rent for the month.